Mesa Grill was never my choice, although I’m always eager to try an Iron Chef’s restaurant. My mother wanted to go there, and I made the reservations, and they came with a stern warning: if you do not cancel 6 hours before your reservation, you will be charged $50 a head. So, not wanting to lose $200, we made our way to Caesar’s palace and Mesa Grill. Chintzy, not kitsch, just chintzy, that’s how Mesa looked to me, but I wasn’t here for the décor, I was here to try that chipotle glazed bone in ribeye. We had to wait 20 minutes for our table, even though we were on time, but our seats weren’t too bad. I had a view of the projector screens at the sports bookie. I’m really not that big a fan of southwest cuisine, and I believe a Mississippi delta tamale is something that all Mexican tamales should aspire to. So with that mindset, there weren’t many things I had to have from the Mesa menu. I did have the tiger shrimp & roasted corn tamale for an appetizer. Bland, that’s how I would describe this tamale. 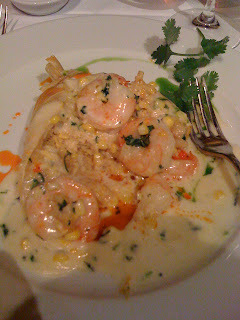 Even the corn cilantro sauce seemed to be unsure of itself, and that surprised me because it is hard for cilantro to take a backseat in a dish. While I watched the Saints lose to the Vikings, and the white sox to the Tampa Bay Rays, the kitchen was preparing my disappointment of a ribeye. It had great potential. The glaze was well balanced and not overpowering, and the red and green chili sauces complimented the glaze and beef very well. Hell, even the first few bites of the steak were great. A good crust, almost prime beef made for some pleasant few bites, but then the truth began to rears its ugly head. This was not a prime cut, it was filled with tough connective tissue and the beef got worse and worse the closer I got to the bone. I had to leave it half finished. I think the book was called “The Nasty Bits”, and in it Anthony Bourdain made a trip to Las Vegas. He made it into a tired, hackneyed spinoff of “Fear and Loathing in Las Vegas”, complete with a “I hate the glitz and glamour, where do the locals hang out” theme. 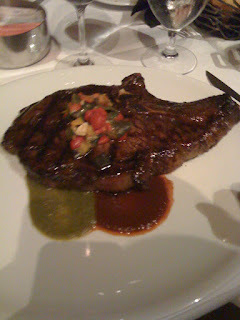 Despite that, Bourdain did make it to Bobby Flay’s Mesa Grill in Caesar’s Palace, and he spoke relatively well of it. Apparently there was some mix up, perhaps I had a single bad cut of beef, or Bourdain has insipid taste buds, either way, I can cross Mesa Grill off my list of Iron Chef Restaurants. Unlike Morimoto’s, Mesa Grill is one I have no intention of revisiting.